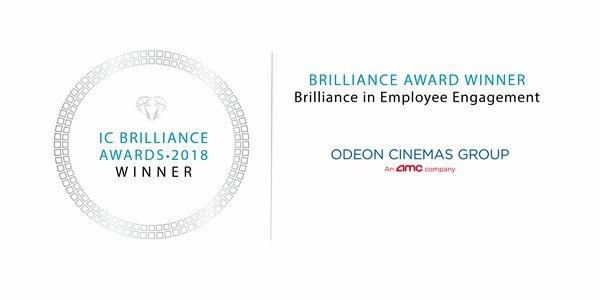 ODEON Cinemas Group has been awarded for ‘Brilliance in Employee Engagement’ for its Vision and Values Festival 2017 ‘Turn it up’ campaign, at the Internal Communications Brilliance Awards held in London on 23 March. The IC Brilliance Awards champion the vital role that Internal Communications plays in the success of an organisation. The creative flexibility shown in the V&V Fest ’17 built on the previous campaign’s success, with festival packs and a range of engagement material created. The increase in engagement levels at ODEON Cinemas Group has been demonstrated through the Group’s Organisational Health Index (OHI) survey, a measure of how colleagues feel about working at ODEON. Survey results showed an unprecedented improvement, moving from third quartile in 2014 to top decile in 2017.